There are a wide variety of very fine waterstones on the market today and each brand has unique characteristics that give it advantages in different situations. 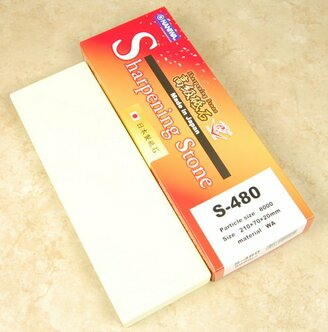 These Naniwa Super Stones from Japan are designed to allow you to sharpen quickly, and with a minimum of maintenance. The latest version of these stones are resin based, so they do not need to be (and should not be) soaked before use. Just a splash of water is all that is required to get you started. Unlike some of the other resin based stones on the market, the Naniwa Super Stones will stay flat for a reasonable amount of use, but are soft enough to be easily flattened by traditional flattening stones or diamond plates. Another great advantage to these stones is that their abrasive is formulated so that it easily breaks down in use to give a very smooth sharpening gradient. The stones are 20 mm thick and do not come on a solid plastic base. They are a US exclusive CKTG item. At 0.75” thick, these stones will last for years of average use. This 8,000 stone is a wonderful final stage for most knives. We believe it’s a great way to get professional results at the end of your sharpening or reshaping regime. Bright yellow color is just great. The creamiest feedback of the super stone line. For doing razors, this is your refresh stone/pre polisher to a natural finish. In a synthetic progression at this stage things really come along. It is quite soft, and not at all muddy. Absolute please to use. Very fun slurry if you wish to sharpen with some. A regular use tool for me.